Boston's rebounding woes are nothing new; but are they fixable? WALTHAM, Mass. -- During one of his pregame radio interviews in early February, Boston Celtics coach Brad Stevens was informed that his team was no longer in last place in the NBA in defensive rebound percentage. "We're not? Did a team drop out of the league?" Stevens deadpanned. The Celtics entered the 2016-17 season with the smallest roster in the league. Routinely quizzed on how Boston could overcome the rebounding deficiencies inherent from its lack of size, Stevens would joke that it was unlikely his team was going to endure a growth spurt so his players would simply have to put an increased priority on boxing out and hope guards could help clean up the glass. The Celtics finished the season ranked 27th in both defensive (75.3) and total rebound (48.5) percentages. For much of the season, 6-foot-2 guard Avery Bradley led Boston in rebounds per game before Al Horford overtook him late in the year. Even still, Horford's 6.8 rebounds per game ranked 45th overall in the NBA. All of that says that rebounding has been an issue for Boston throughout the season. And those struggles were back in the spotlight on Sunday night when the Chicago Bulls turned 20 offensive rebounds into 23 second-chance points as part of a 106-102 Game 1 triumph at TD Garden. The Celtics finished the night by grabbing just 54.5 percent of available defensive rebounds, a jarringly low number considering the league average is more than 20 percent higher. Boston was actually far more competitive in the second half but still had instances where second-chance opportunities negated otherwise strong first-shot defensive stands. When his team huddled to watch film on Monday afternoon at the team's practice facility, Stevens implored his players to initiate contact when shots go up. 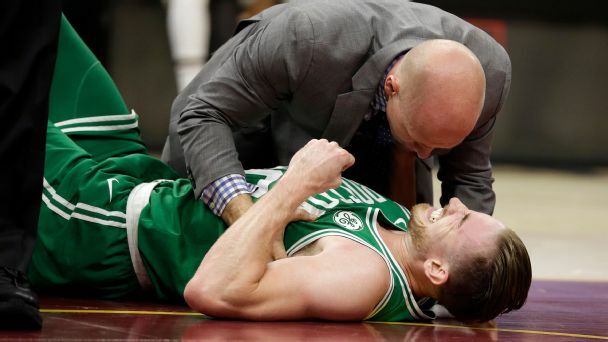 "You're not going to get every defensive rebound, but you've got to hit first," Stevens said. "And you can't wait to make contact when [Robin] Lopez is running into the paint. If he's at the charge circle, he's winning that battle. The same thing if somebody's running from the corner to get an offensive rebound. You can't wait until they get into the paint to make contact. You've got to block out sooner than that. "That doesn't guarantee you're gonna get it every time, but that gives you a better chance." The Celtics' big men acknowledged that the team's issues were rather obvious on film. "There's just stuff that we can clean up," starting center Amir Johnson said. "Some guys were just caught staring, looking at the ball, instead of just hitting the body and going and getting it. It's just all-out effort and you just gotta continue doing your job; the play never stops until a person gets the rebound. Once you do your job defensively, you get in your defensive coverages, and then the shot finally goes out, sometimes you just get caught staring at the shot like, 'OK, I've done my job.' But the job isn't over until you actually get in front of your man and get the ball. "It's a team effort. That's a big key to winning that game. I thought our half-court defense was pretty good besides [the fact that] it seemed like, if they put up a shot and missed, they got the ball and put the ball back in the basket. Our half-court defense was definitely up to par. We just gotta rebound." Not unlike most teams, the Celtics have pronounced splits in how they rebound in wins versus losses. During the regular season, Boston owned a defensive rebound rate of 76.6 percent in its 53 wins. It dipped to 72.8 percent in its 29 losses. It's prudent to remember that defensive rebound rate is not the primary indicator of team success. The Golden State Warriors ranked 29th in the NBA in grabbing just 74.9 percent of available defensive rebounds and still won 67 games. Likewise, height isn't necessarily an excuse for rebounding woes, as the Cleveland Cavaliers were the second-shortest team to start the season and finished in the top 12 in defensive rebound percentage. For Boston, rebounding comes down to effort and commitment. It's a fairly good indicator of how engaged the Celtics are on a game-to-game basis. Maybe Chicago's Jimmy Butler summed up rebounding best on Monday after gushing about how Lopez impacted Sunday's Game 1 win. "If you want to go get the ball, you're going to go get the ball. Rebounding is 95 percent effort, 5 percent technique," Butler said. "Same thing with the defensive part. If you want to do it, you're gonna do it. If you don't, you won't." The Celtics must come out committed to rebounding on Tuesday night. The Bulls, post-All-Star break (and post-Taj Gibson trade), ranked in the back half of the league in offensive rebound percentage. Boston isn't going to get to every rebound, but giving up 16 first-half offensive rebounds, like the Celtics did on Sunday, cannot happen again. Simply being competitive on the glass is clearly important against the Bulls. In Chicago's three head-to-head wins over Boston this season, including Sunday, the Bulls outrebounded the Celtics by 17, 19 and 20 overall rebounds, respectively. Boston absolutely has other issues to address moving forward in this series, especially the question of who will step up when Isaiah Thomas is on the bench (the Celtics were outscored 27-11 without Thomas on Sunday). The Celtics must strive to avoid foul trouble, especially at the wing positions, in order to aggressively defend Butler throughout the game. Rebounding will be the area most eyes are watching, however. The Celtics knew entering the series that they had to be competitive on the glass and were reminded of that on Sunday. “[Rebounding] was the game. That's the game. That's the series," Crowder said. "If we don't rebound, we don't win the series. It's simple."